We added instant coffee, raspberry jam and fresh berries to our favourite brownie recipe to make these scrumptious coffeehouse-inspired brownies. Microwave chocolate, butter, water and coffee granules in large microwaveable bowl on HIGH 2 min. or until butter is melted. Stir until chocolate is completely melted. Add granulated and brown sugars; mix well. Add eggs and vanilla; beat 2 min. Stir in jam. Add flour and baking powder; stir well until blended. Spread into prepared pan. Bake 35 to 40 min. or until toothpick inserted into centre comes out with fudgy crumbs. (Do not overbake.) Cool completely. 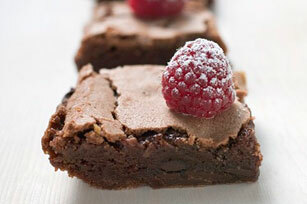 Use foil handles to remove brownie from pan before cutting into bars. Cut into 16 squares. Top each with 1 raspberry; sprinkle with icing sugar. Omit icing sugar. Bake brownies as directed. Remove from pan; cut into diamond-shaped bars. Garnish each bar with a fresh raspberry just before serving.